Before and after in dental office whitening One of the most common questions we get in the dental office is, “What is the best way to whiten my teeth?” There are quite a few different ways to attain a whiter smile. Which method you use would depend on how much whitening you want for your teeth. If you are just wanting to whiten your smile a little bit, there are dental product that can easily be attained at a local drug or retail store.Whitening toothpastes are readily available, and can be useful when you are just wanting some minor whitening.There are also dental bleaching kits, such as white strips, that can be purchased at a local store. These products are going to be a little more effective in whitening, than the toothpaste is. In cases where more extensive whitening is desired, it would be necessary to visit your dentist. In the dental office, there are two common techniques that are used. One of these techniques is Zoom, which is a one hour bleaching system done in the office. The other is custom bleaching trays that you have made at the dental office, then you take those and professional strength bleach home with you. This is my personal favorite method, because it gives me more control over my bleaching, and I can do it when I want. There are other techniques, such as laser bleaching, and even some as generic as baking soda. With any type of bleaching, sensitivity is a concern. The more aggressive the bleaching technique, the more common sensitivity is. Sensitivity toothpastes can be useful in helping with dental sensitivity. Also starting out slowly, and stopping when you start to feel any dental sensitivity is a good idea. You can start up again when the sensitivity goes away. No matter which method you use to get your teeth to the shade you desire, eventually they will have to be touched up. Common food and drinks we consume will stain our teeth again. If you start to notice some staining, just start your bleaching cycle again. It will not take very long to get them back to your preferred shade. These are some basics on dental bleaching. We will be posting a series of blogs on dental bleaching over the next month. If you do not have a dental office you call home, we invite you to join our dental family in Huntington Beach, or Corona CA. 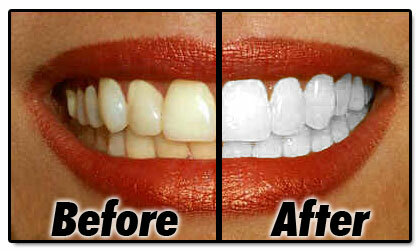 We offer in office bleaching, along with a number of other dental services.